Innsbruck and the Tyrol are hosts of major sports events on a regular basis. These events would not be possible without the engaged support of volunteers. After the 1st Youth Olympic Winter Games 2012 (YOG), where 1,400 volunteers were in action, Innsbruck again was the host of an international major youth sports event in 2016 – the International Children’s Winter Games (ICG). In the course of planning the ICG 2016 we launched the 1st Volunteer Platform in Austria and look forward to supporting and servicing different major (sport) events in the coming years together with many motivated volunteers. 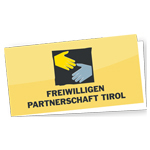 You can find out here, how to become part of the volunteer team tirol!